Cathryn Dawn Nykvist, Trivedi Global Inc.
Celine Lavelle, Trivedi Global Inc.
Daniel Paul Przybylski, Trivedi Global Inc.
Dianne Heather Vincent, Trivedi Global Inc.
Dorothy Felger, Trivedi Global Inc.
Douglas Jay Konersman, Trivedi Global Inc.
Elizabeth Ann Feeney, Trivedi Global Inc.
Joanne Lydia Starodub, Trivedi Global Inc.
Karan Rasdan, Trivedi Global Inc.
Karen Mie Strassman, Trivedi Global Inc.
Leonid Soboleff, Trivedi Global Inc.
Maire Mayne, Trivedi Global Inc.
Mary M. Keesee, Trivedi Global Inc.
Padmanabha Narayana Pillai, Trivedi Global Inc.
Pamela Clarkson Ansley, Trivedi Global Inc.
Ronald David Schmitz, Trivedi Global Inc.
Sharyn Marie Sodomora, Trivedi Global Inc. The use of an herbomineral formulation in the healthcare sector for different chronic diseases is gaining popularity due to its fewer side-effects, high safety profile, and cost effectiveness. A new proprietary herbomineral formulation was formulated, consisting of four essential ingredients viz. herbal (ashwagandha root extract) and minerals (zinc chloride, magnesium gluconate, and sodium selenate). 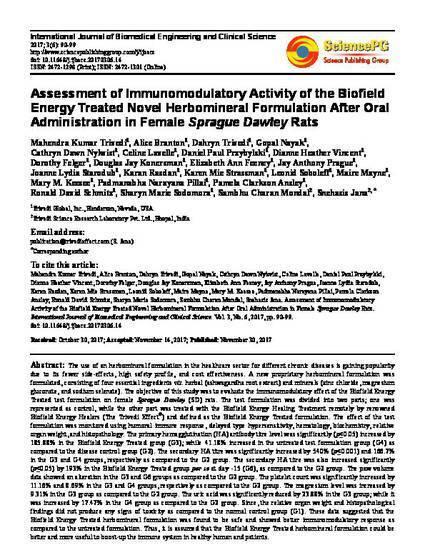 The objective of this study was to evaluate the immunomodulatory effect of the Biofield Energy Treated test formulation on female Sprague Dawley (SD) rats. The test formulation was divided into two parts; one was represented as control, while the other part was treated with the Biofield Energy Healing Treatment remotely by renowned Biofield Energy Healers (The Trivedi Effect®) and defined as the Biofield Energy Treated formulation. The effect of the test formulation was monitored using humoral immune response, delayed type hypersensitivity, hematology, biochemistry, relative organ weight, and histopathology. The primary hemagglutination (HA) antibody titre level was significantly (p≤0.05) increased by 185.88% in the Biofield Energy Treated group (G3); while 41.18% increased in the untreated test formulation group (G4) as compared to the disease control group (G2). The secondary HA titre was significantly increased by 540% (p≤0.001) and 166.7% in the G3 and G4 groups, respectively as compared to the G2 group. The secondary HA titre was also increased significantly (p≤0.05) by 193% in the Biofield Energy Treated group per se at day -15 (G6), as compared to the G2 group. The paw volume data showed an alteration in the G3 and G6 groups as compared to the G2 group. The platelet count was significantly increased by 11.16% and 8.69% in the G3 and G4 groups, respectively as compared to the G2 group. The magnesium level was increased by 9.31% in the G3 group as compared to the G2 group. The uric acid was significantly reduced by 23.88% in the G3 group; while it was increased by 17.47% in the G4 group as compared to the G2 group. Since, the relative organ weight and histopathological findings did not produce any signs of toxicity as compared to the normal control group (G1). These data suggested that the Biofield Energy Treated herbomineral formulation was found to be safe and showed better immunomodulatory response as compared to the untreated formulation. Thus, it is assumed that the Biofield Energy Treated herbomineral formulation could be better and more useful to boost-up the immune system in healthy human and patients.